Zen Zone-Yoga & Vegetarianism – Olive For Greens. I know what you may be thinking- She is a vegetarian and she does yoga. How cliché! Well, yes. As much as I don’t like to be a stereotype, this time I am. But these go hand in hand for me. I was a pretty casual gal before this and I still am! I’ve just revamped my passé lifestyle. Beyond creativity, everything else around me expanded when I began a vegetarian except my waist line. I feel calmer, healthier, and simpler. I started thinking, are the vegetable giving me mental clarity? Perhaps. Or is it yoga that should be taking all of the credit? Yoga actually came 2 months before vegetarianism for me. When I began my yoga practice, I wasn’t sure if it was for me. I wanted to try it and figured, since I purchased a Groupon for a few yoga classes, I would give it a shot. At worse, the only thing I had to lose was the $25 I spent on the classes. I ended up becoming strangely addicted to the yoga. By the fifth class, my flexibility had improved and I was holding poses better than the first class. Every time I left the studio, I felt lighter-physically. To hold onto that “light” feeling, I ate lighter meals afterwards. In the beginning, I was not a vegetarian. However, I noticed that my post-yoga meals consisted of vegetables and I, therefore, indirectly transitioned into vegetarianism by limiting my meat intake. My body was experiencing something it never had before. I wasn’t exactly sure what it was but I knew I liked it. You do not, by any means, have to be or become a vegetarian to enjoy yoga. And vice versa. I will say it is quite a liberating experience. From the energy in the room to the breathing exercises, it’s amazing. There are many types of yoga practices out there. My primary practice is Kundalini Hot Yoga. “Kundalini is a psycho-spiritual energy, the energy of the consciousness, which is thought to reside within the sleeping body, and is aroused either through spiritual discipline or spontaneously to bring new states of consciousness.” That is the best explanation I found and it is all true. 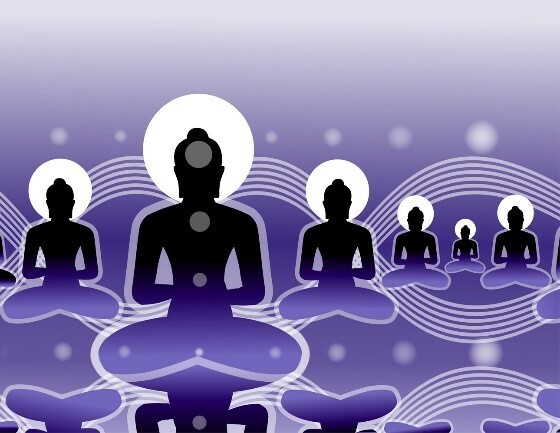 It also focuses on waking up our seven chakras (pictured below). There is a different calmness and serenity to this practice. It relieved my stress and helped my patience-I think because of the breathing aspect. All this happens in a 90-100 degrees Fahrenheit room. You might be thinking that I am crazy. I thought I was too, at first. But I really love it now. And I would be crazy to stop this practice. Plus there are so many benefits to hot yoga such as increasing flexibility, detoxing, weight loss, improving skin and so much more. Occasionally, I throw Vinyasa into my practice. Viyasa is also known as flow yoga. There is a flow in the movements that connect into each pose. Plank, chaturanga, and upward facing dog is the common flow. Comparing Kundalni and Vinyasa, I would say vinyasa is more “intense”. By intense I mean there is way more movement. There is plenty of movement in kundalini but I find myself closing my eyes more with kundalini- focusing and properly breathing. Either way this picture turns, I love both practicing yoga and eating vegetarian food. I hope you attempt either or both. Like most things, this lifestyle is not for everyone. But effort and dedication stretches for miles. Also you don’t if you like something until you try it! Please note that there are many types of yoga out there-these are just 2 examples. Most people think that all salad dressing have to have oil and vinegar to be healthy or believe that is the base of salad dressing. Well, it’s not true! 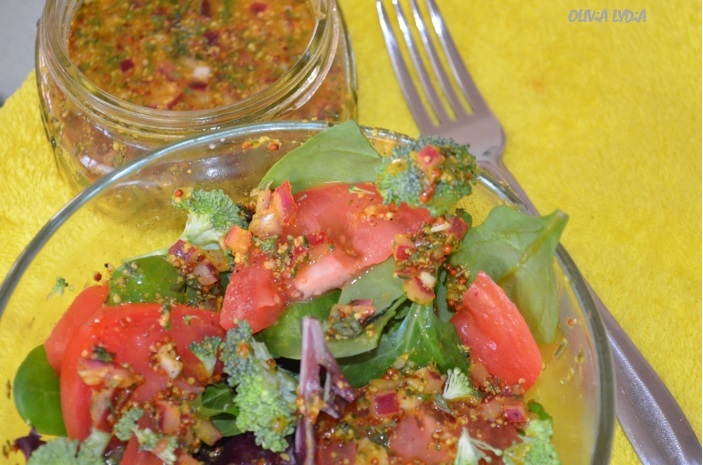 This a light but filling salad with a tangy vinaigrette style dressing that will make you not want to buy that bottled dressing anymore. Please note that if you absolutely miss the oil this salad dressing or are including healthy fats in your diet to gain weight (or otherwise!) add 2 tablespoons of olive oil. Note: The ingredients below will make for 2-4 servings of salad. Note: I used a lot of onions in mine (about 2-3 tbsp). You may use less! Combine all of the contents in a small bowl. Lightly whisk with a fork. 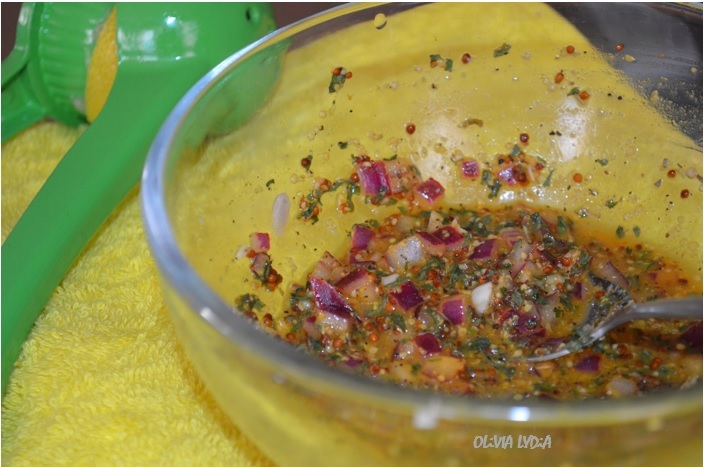 Tip: This dressing will store in the refrigerator, so double or triple the ingredients for later use! Store in a small mason jar. Add salad ingredients to a bowl. Top with a few teaspoons of Salad dressing. For larger salads (for multiple people) add salad ingredients to a large bowl with a little bit of dressing at a time. Tip: Remember soggy salads are not good salads. 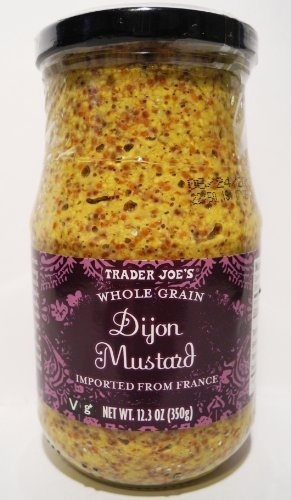 This is the whole Dijon I used in my dressing. Pingback: Fruit… The New Fast Food! [+Smoothie Recipe] | OliveforGreens! Pingback: Kale & Ricotta Naan Pizza – Olive For Greens. Pingback: Chorizo-Fajita Pasta – Olive For Greens.